Dr. Miller joined the University of Kansas after eight years in an industrial research group at Control Data Corporation in Minnesota. His primary area of research interest is in computer graphics. His work in industry centered on Geometric Modeling and its applications to mechanical Computer-Aided Design. 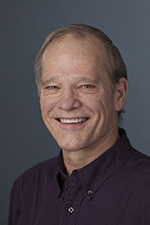 Over the past several years, he has focused on Visualization, working with researchers in a wide variety of areas including climatology, mathematics, soil science, and GIS. He spent several years working with the NASA World Wind team exploring several technologies and their incorporation into the World Wind Open Source API. Miller is currently involved in an ongoing project with the University of Kansas’ Spencer Museum of Art, in which a Storytelling metaphor is being developed to help users create their own visual narrative using the Spencer’s database of art object holdings, artists, and exhibitions.